With a History&apos;s Hometown Bumper Sticker! 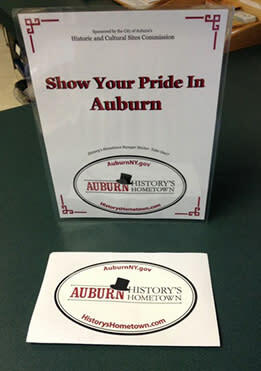 August 25, 2015, Auburn, NY - Auburn’s Historic and Cultural Sites Commission has produced new bumper stickers featuring the ‘History’s Hometown’ logo that promote Auburn’s world-class historic and cultural sites; Auburn Public Theater, Cayuga Museum and Case Research Lab, Fort Hill Cemetery, Harriet Tubman Home, Schweinfurth Art Center, Seward House Museum, Auburn Schine’s Theater and Willard Memorial Chapel. Auburn’s Historic & Cultural Sites Commissions is a group of organizations whose mission is to promote Auburn’s historic and cultural attractions through collaborative marketing, programming, and tourism strategies. The Commission is funded by the City of Auburn. The Commission site organizations include Auburn Public Theater, Auburn Schine’s Theater, Cayuga Museum & Case Research Lab, Harriet Tubman Home, Schweinfurth Art Center, Seward House Museum and Willard Memorial Chapel. The Commission agencies include Auburn Enlarged School District, Cayuga County Arts Council, Cayuga County Chamber of Commerce, Cayuga County Historian’s Office, Cayuga County Office of Tourism, and the Auburn Downtown Business Improvement District. The vision of the Commission is to position Auburn as the destination of choice in the Finger Lakes through support and promotion of its history and cultural. For more information on Auburn’s Historic & Cultural Sites Commission visit www.historyshometown.com.